Natural thyroid treatment involves changes to your diet, taking thyroid supplements, or using home remedies for thyroid health. If you suffer from hypothyroidism, you will probably need to continue thyroid treatment by your doctor to maintain normal levels of thyroid hormones. However, there are many natural treatments to help treat or manage a sluggish thyroid. For example, a hypothyroidism diet means avoiding certain foods such as soy and gluten that may interfere with thyroid function. Also, consuming foods for thyroid health such as ones rich in selenium, zinc, and vitamins may help to improve your thyroid condition naturally. Other ways to treat an underactive thyroid include supplements for hypothyroidism such as ashwagandha, iron, or turmeric. In this article, you will find out about the best natural remedies for hypothyroidism and if these thyroid treatments are backed by science. You will also learn about foods to include and foods to avoid with hypothyroidism. Hypothyroidism is a condition where your thyroid gland doesn’t work properly and doesn’t produce enough thyroid hormone. Often, hypothyroidism is referred to as an underactive thyroid. Doctors diagnose hypothyroidism using a blood test to check for levels of thyroid-stimulating hormone (TSH). If TSH levels are too high, the thyroid can become sluggish and stop producing enough thyroid hormone. What are Some Hypothyroidism Symptoms? Checking your TSH levels (as well thyroid hormones) is the best way to confirm a diagnosis of hypothyroidism. However, a person will usually have various symptoms that their thyroid isn’t producing enough thyroid hormone. Find out about more signs that show you may be suffering from a thyroid disorder. What is the Conventional Treatment for Hypothyroidism? Treating a thyroid hormone deficiency usually requires prescribing hormone replacement therapy. The purpose of traditional thyroid treatment is to increase T4 hormone levels within the normal range. To find out more about T3 and T4, please read my complete guide to thyroid hormones T3 and T4. What are Natural Thyroid Treatments? If you take medication for hypothyroidism, you may find it helpful to also use natural remedies for thyroid disorders. Although there is no natural thyroid medication that doctors recommend, holistic treatments for hypothyroidism can help to improve your thyroid condition. Just make sure to consult with your doctor before taking any natural supplements as some of them may interfere with medications. Iodine is not a natural alternative to levothyroxine, but your thyroid needs iodine to produce enough hormones. Sources of foods containing iodine that can prevent iodine-related hypothyroidism include seafood, kelp, dairy products, and salt fortified with iodine. You should always speak to your doctor before taking iodine supplements for an underactive thyroid. Further reading: Proven Health Benefits of Kelp: For Thyroid, Weight Loss, Heart Health and More. Selenium is among the natural supplements for hypothyroidism as the mineral helps to metabolize thyroid hormones. Before taking selenium to help treat hypothyroidism naturally, you should speak with your doctor to see how the nutrient may affect your thyroid medication. Taking zinc can be helpful for a low thyroid because zinc deficiencies are common in people with a sluggish thyroid. Find out more about the signs of a zinc deficiency and what you can do to get more zinc in your diet. Getting enough iron in your diet is essential to prevent thyroid problems. You can learn about the main signs of an iron deficiency to learn when you need to take supplements. Find out what are the best supplements for addressing iron deficiencies. It is important to make sure and get enough vitamin D to help prevent thyroid disorders such as Hashimoto’s thyroiditis or Graves’ disease. Learn more about some of the other diseases that could be linked to a vitamin D deficiency. Very often vitamin D is an essential nutrient that is missing from our diets. Taking ashwagandha as a natural thyroid supplement could help to boost levels of thyroid hormones and improve your quality of life. If you are interested to know more about ashwagandha and how this herbal supplement promotes good health, please read this article. Turmeric is one of the herbs for thyroid disorders as its antioxidant properties have a beneficial effect on thyroid health. Learn more about the benefits of taking turmeric and how this spice can help reduce inflammation in your body. One natural thyroid medication is aloe vera juice because it can reverse some of the effects of hypothyroidism. Learn more about aloe vera juice and how drinking aloe vera can be useful as a Hashimoto’s thyroiditis natural treatment if you have a weak thyroid. What is the Hypothyroidism Diet or Thyroid Diet? The “thyroid diet” is designed to support healthy thyroid function while you are undergoing thyroid treatment. A healthy diet and regular exercise will also help you lose weight with hypothyroidism. There is some evidence that consuming a plant-based diet can support healthy thyroid function. If you are looking for a diet for hypothyroidism and take thyroid support supplements, it is important to avoid certain foods. Natural remedies for low thyroid function can involve removing from your diet foods containing soy, gluten, or foods that inhibit thyroid function. Most dietary advice for hypothyroidism recommends to avoid the consumption of large amounts of soy and soy-based foods. The reason why soy is one of the foods to avoid on a Hashimoto’s thyroiditis diet is that soy protein and soy isoflavones can affect the thyroid gland. Learn more about the potential benefits and health risks of consuming soy products. You will also find out why fermented soy eliminates many of the health concerns associated with soy. Although vegetables such as kale, broccoli, cauliflower, turnips, and bok choy are generally healthy, they contain compounds that can affect thyroid function (goitrogenic foods). Gluten is a protein found in many grains, and celiac disease is often associated with autoimmune thyroid disorders. Further reading: 10 Symptoms of Gluten Sensitivity (NCGS) You Didn’t Know About (Evidence Based). I have most of these symptoms constipation bring cold tinglin weight gain horse voice thin hair and have been doc twice for blood test and they tell me nothing wrong so wont help me . Deborah I have the same thing,,I have a severe intolerance for cold,,,I mean I will actually cry and it takes forever to warm up., Severe constipation problems, a hoarse voice, my hair falls out in clumps in the shower,,I have lost some weight and I needed to so I had to work very hard at it and now I am stuck with about 13 lbs to go that I just can’t get off, no matter how hard I try, my eyebrows are very thin at the ends and not because I pluck them that way. Tired all the time,,I mean I have like every symptom and I got tested and they say I am fine,,,I don’t believe it,,my cousin, mom, aunt and sister have also had thyroid problems,,For my Mom they had to do an advanced test until it showed up..Her first test results were normal,,I think I am going back to the doctors and insist they do more tests or put me on meds cause this is crazy and I think you should do the same,,,we need to take care of ourselves. I have te same issue. Strong family history, goiter , all hypo symptoms… Still told I’m ok…. Very frustrating! Deborah, a lot of doctors only check one thing. There’s a t3 and t4 that needs to be checked. That’s a problem for me too and a lot of doctors seem to neglect that. Think about seeing a rheumatologist. I had same issue. My thyroid levels were normal but I have Hashimoto which I was actually discovered by rheumatologist test. Later I had a thyroid ultrasound and they can see the inflammation on my thyroid. Your ths can be normal and still have Hashimoto, which actually acts like hypothyroidism. Have your symptoms improved now? Have you been treated for this condition? I seem to have the same problem. What if you don’t have a thyroid? Do these options still help. I’ve heard of no soy, but love edamame. I also have hypothyroidism. I can tell you that the generic levosynthroid that you get cheap with an Rx is not a good fit for many people. it just does not work. I think that each person must find out what their thyroid lab values are when they are feeling well. often it seems that what the physician believes to be adequate lab values are not reflected in a reduction of symptoms for the individual. a high normal THS result might not get you where you need to be. maybe yours needs to be a lower number. it elevates as you have less circulation thyroid hormone. have a real serious talk with you medical doctor and do not but silenced because you lab values are in the so called “normal range” you need to get yourself educated about this disorder so that you can gain some control of your treatment. remember that it is not the MD who has to live with the symptoms of this disorder, YOU DO. so it is up to you to take back some control with knowledge and common sense. there is an otc at the natural herb stores called thyroid support for those who need it. just be cautious when taking this. start with half the recommended does for a few weeks to see how you feel, that might be enough for you. if you have a heart condition talk with md before use, or if you begin to experience any cardiac flutters or palpatations…get to the ER and stop taking it. be sure that you let the md know that you are taking this supplement. most mds will warn you off of herbals… just so you know but if you are having heart issues it is time to fess up and tell them the truth. be careful. I’m in the same boat! It is miserable and embarrassing! I can’t even move with out breaking into a dripping sweaty mess! Iam 61 years old .My tsh test is 6.9. Is it normal or high?. Iam a diabetic person. Hi Adib, I’m not a doctor hence cannot give advice in specific cases. 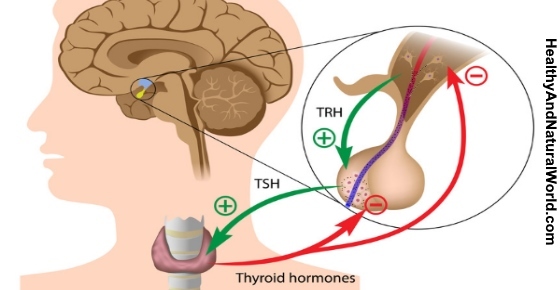 Generally speaking, you can find more information about levels of TSH in my article “TSH Levels: Normal, High, or Low (Including Optimal Thyroid Levels)“.